According to Kaspersky Lab, on any given day over 300,000 new malware samples are detected throughout the world. Furthermore, according to a 2016 report from the FBI, approximately 4,000 ransomware attacks occurred per day—an increase of 300% from 2015. During this period, Kaspersky also reports that attacks on businesses increased from once every 2 minutes to once every 40 seconds. These attacks range anywhere from ransomware like the much publicized WannaCry attacks of 2017, to institutional heists like the 2016 Bangladesh Bank robbery where nearly one billion USD was at stake. With much of the ins and outs of our daily lives conducted digitally, cybersecurity has become the arms race of the 21st century where the many respective sides endeavor to be one step ahead of their counterparts. Research conducted by Professor Joon Hak Oh from the Department of Chemical Engineering at Pohang University of Science and Technology has successfully introduced a means to stay one step ahead in the cybersecurity arms race through not a software-based patchwork solution but a hardware-based blockade. 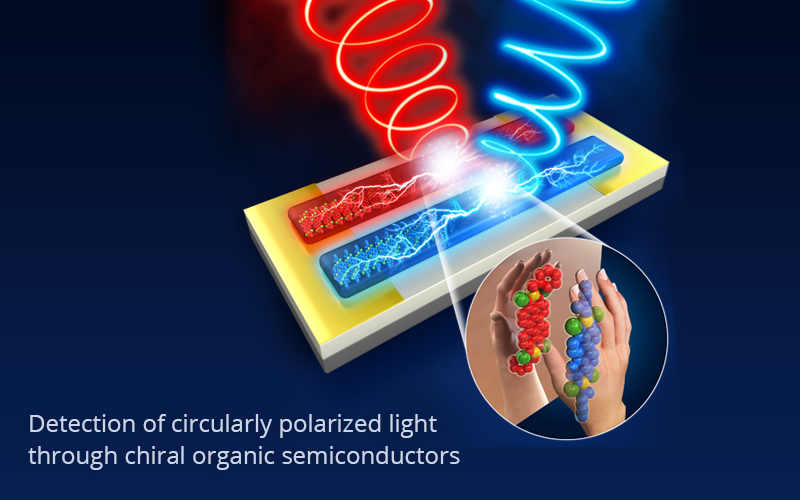 The team has developed a novel method through chiral supramolecular nanostructures with optoelectronic functions to enable highly selective detection of circularly polarized light—for the first time—in the visible spectral range. This achievement has been published in the world-renowned Advanced Materials. Chirality, or ‘handedness,’ can be easily understood by looking at our hands. The typical left and right hands both have the same features and shape but are mirror images and thus cannot be superposed upon each other. Circularly polarized light differs from linearly polarized light in its chiral characteristics—in other words, circularly polarized light comes in two forms: right-rotating and left-rotating. And much like our right hand and left hand, the two circularly polarized lights are similar but ultimately different. Selective detection and discrimination of the two circularly polarized lights, which would greatly enhance the security of the digital data being transmitted through the light, have previously required additional components such as the phase retardation film. Such extraneous parts require additional manufacturing steps and have proven difficult to miniaturize into practical sizes. The research team created an elegant solution to the problem by successfully synthesizing photoconductive chiral organic semiconductors (OSCs) based on perylene diimides. The newly synthesized OSCs exhibited superior charge transport with significantly higher photo-responsivity when compared to alternative methods. Professor Oh remarked on the noteworthiness of this research because in contrast with previously existing methods that were limited to the ultraviolet region, the new OSCs extends the range of spectral sensing to the visible region thus making it highly promising for practical applications such as image sensors, optical scanners, and security-enhanced optical communications. He is confident that this research will open new possibilities for use of supramolecular nanostructures consisting of chiral OSCs in chiral optoelectronics.